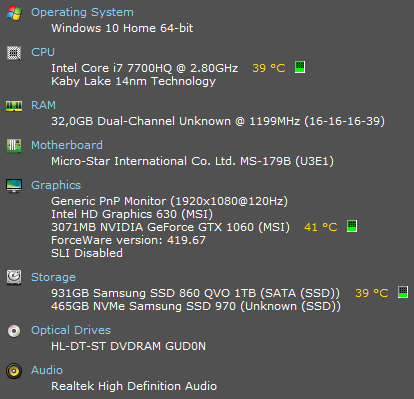 I might have to get a laptop soon and wondered If I can afford one to play WoT at any reasonable level. Specifically I'd like advice on minimum processor and graphics. I was thinking to get some i5 or more in any case. It came with 16GB of RAM and a different SSD + a mechanical HDD but still it was about 550€ and even without my upgrades it had no issues running WoT on max settings. So not too bad. I'll take a look and see what I can get. Btw what did you use to get the system pic? I'm sure it depends a lot on location what you can find and to what price but playing WoT on decent settings don't have to be all that expensive and if everything else fails you most likely have some local shop that have second hand laptops in stock and if it's just a second computer you want to have with you on the road so to speak I'd say that don't matter that much. Got a local shop here that just now received about 3000 two year old Lenovo ThinkPads that's been used in all the governmental agencies around here, so you can pick up a laptop with a i7, 12GB RAM for 200-250€ depending on GPU and SSD size in them, I bought two and gave hem to my parents since it's easier to have them come to me when I need to press "Yes" on something or "Do you want to run Windows Update".